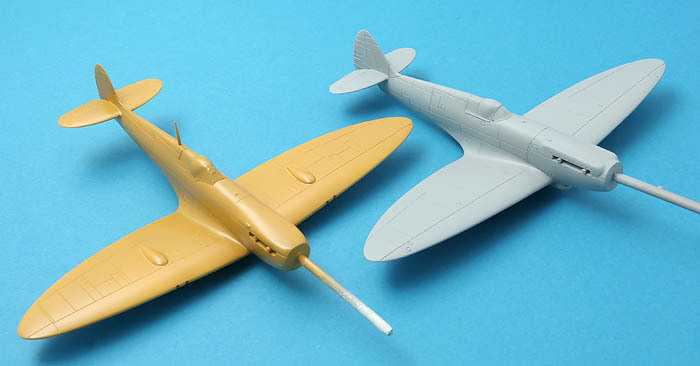 The Spitfire Forums » Aviation Heritage » Modelling » 1/72 Airfix Spitfire pair - IX and XIX! 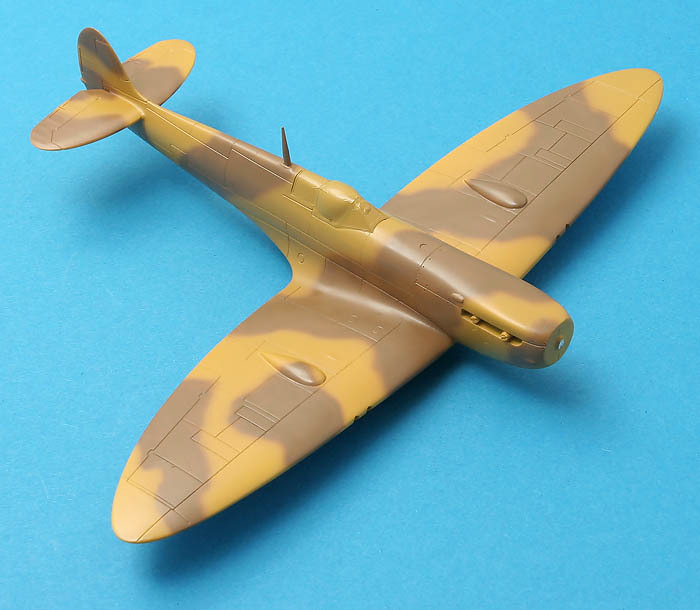 I've had a very good evening in the modelling corner. Canopies are masked and on and first layer of paint sprayed! Brown is Gunze H71 Mid Stone "out of the bottle" and grey is the old Aeromaster Warbid Acrylic Medium Sea Grey with a drop of PRU Blue to turn it more blueish! Another hour of work with the airbrush! Dark Earth is Gunze H72 sprayed freehand. 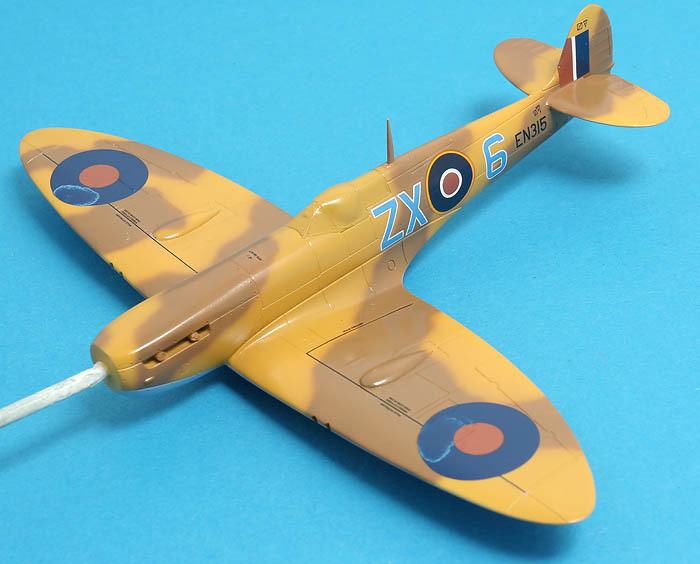 Re: 1/72 Airfix Spitfire pair - IX and XIX! I couldn't avoid masking altogether! Anyway, now the basic camo is finished on the Mk IX! 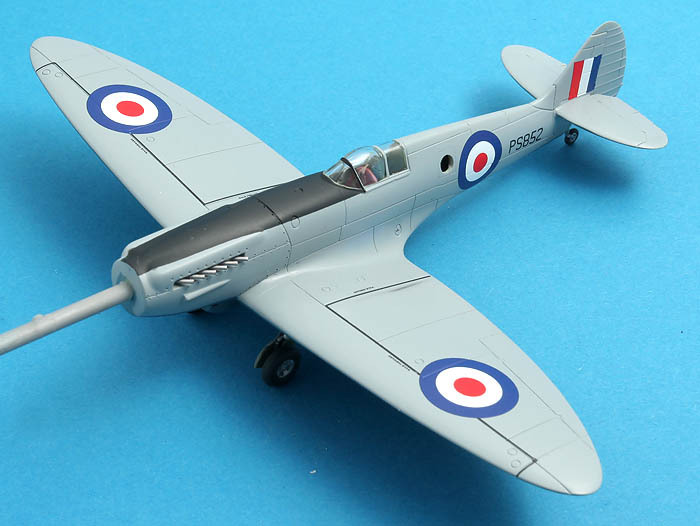 And now the Mk XIX as well! Decalling has started on both aircraft. I bought a sheet of rub-down stencil transfers at Telford from Korean manufacturer HobbyDecal. A nice alternative to ordinary decals! 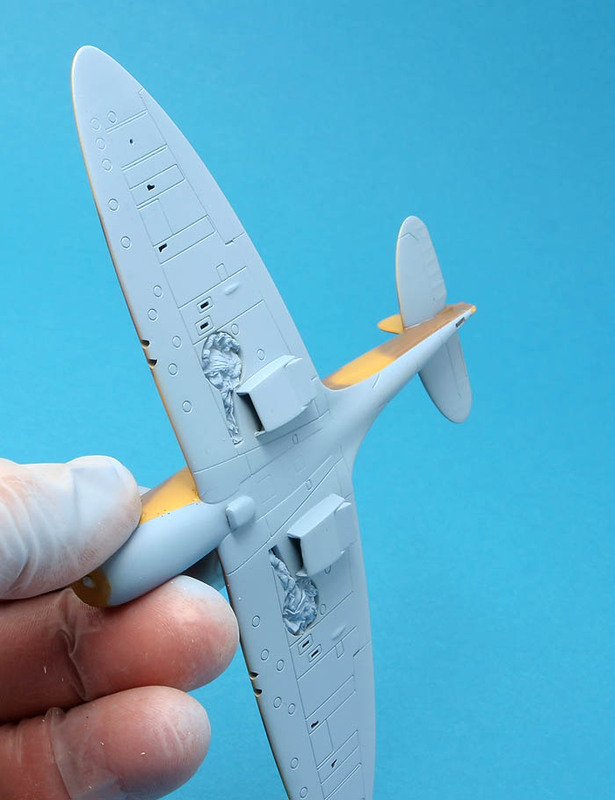 The Mk IX will use most of the decals from the Airfix sheet. 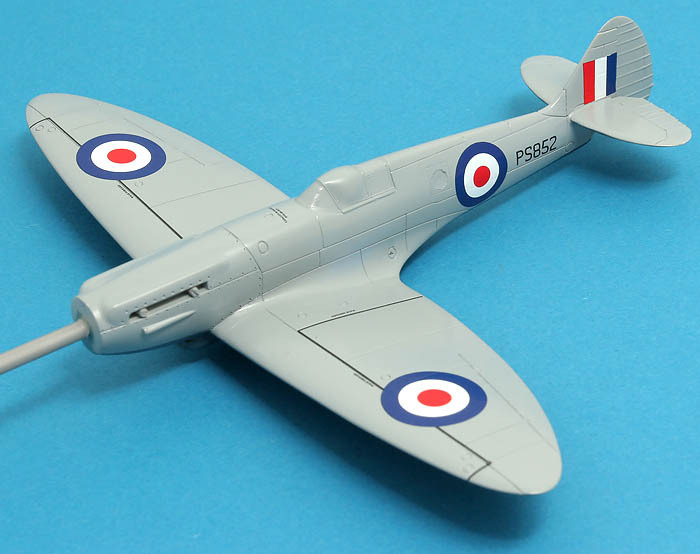 Stencilling and roundels have been added to the wings! 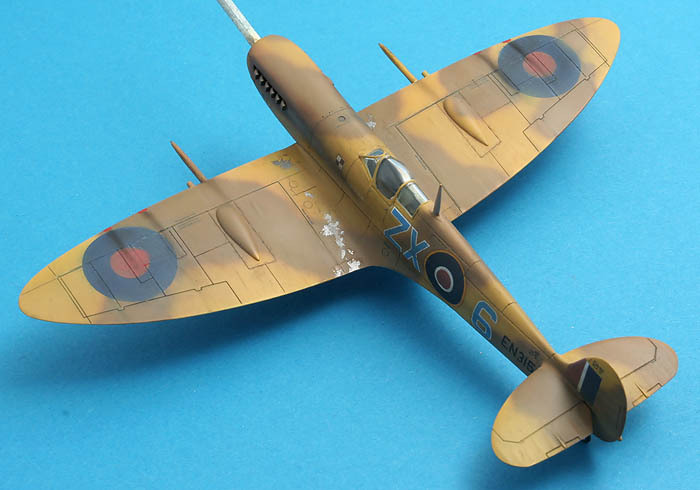 Wing roundels were pilfered from an Iliad Design sheet that I had in stock. 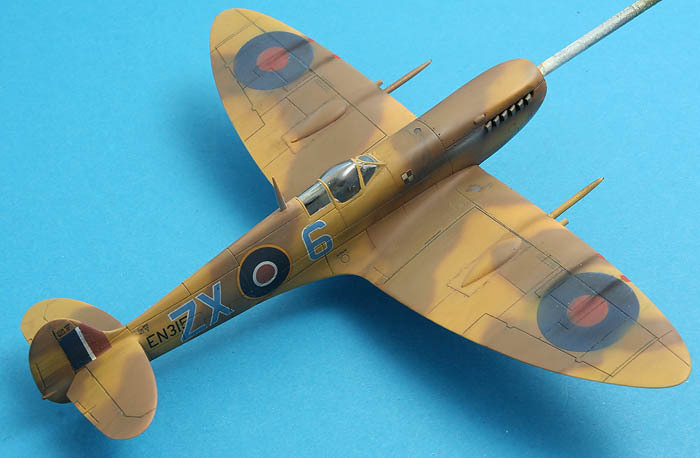 I found the red of the Airfix decals a bit too brown for my taste. If I hadn't had an alternative I would have been prepared to live with the problem, it is not that bad, but since lack of spare decals isn't one of the major problems around here I could as well exchange them for something more in my taste! 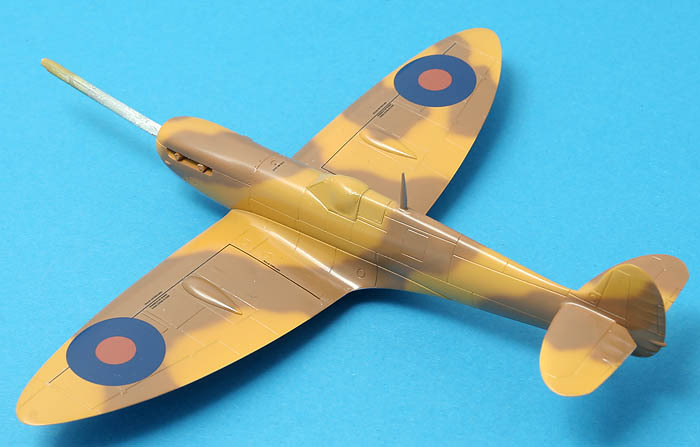 I think you're right going for the brighter roundels, especially on an Trop Spitfire and/or on upper wings. 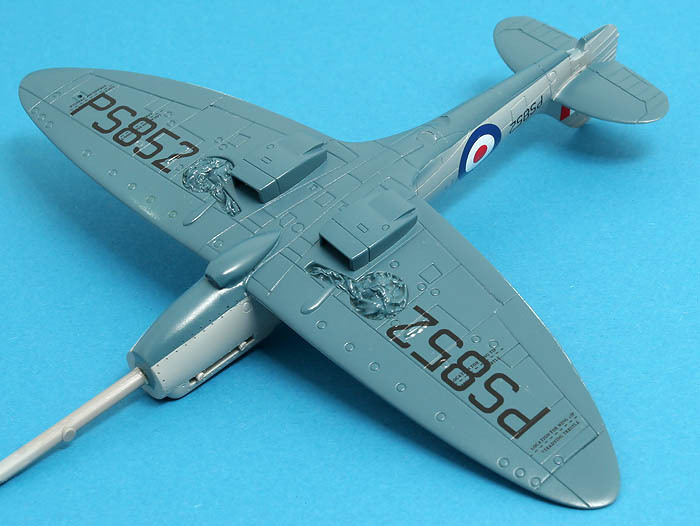 The RAF rounder blue colour had a notable touch of indigo in it, which usually showed as the colour faded through sun exposure and wear. 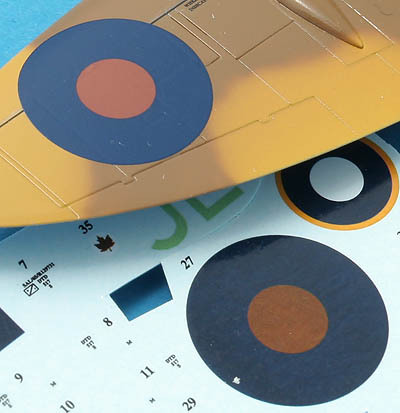 Most of the RAF decal sheets on the market look decidedly un-weathered. 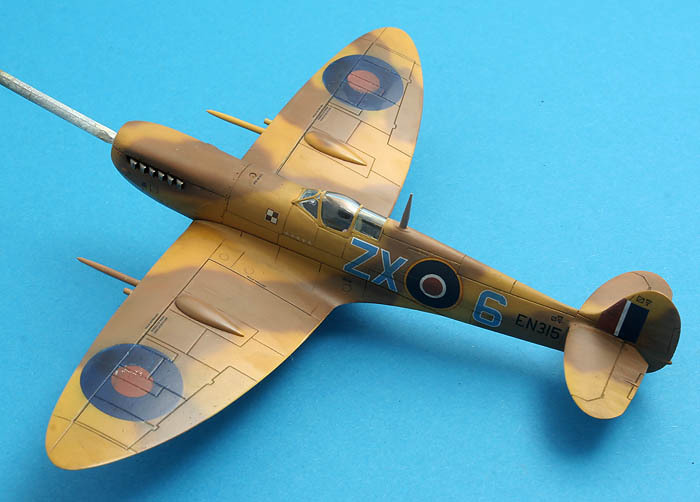 Airfix decals behave well, thankfully... Only a few more stencils and the Polish chessboards left to add... 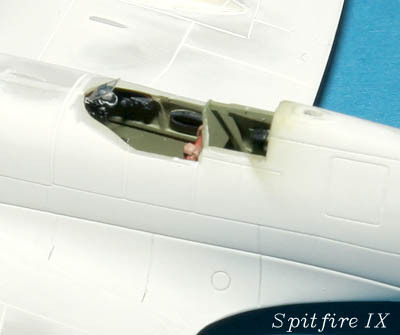 The milky residue on the wing roundels came after I had used Super Sol on them to make them snuggle into the panel lines. And it won't go away... I can always touch up with paint. I shall write a piece on modelling and chemistry one day, or rather on the subject of incompatible modelling chemistry! 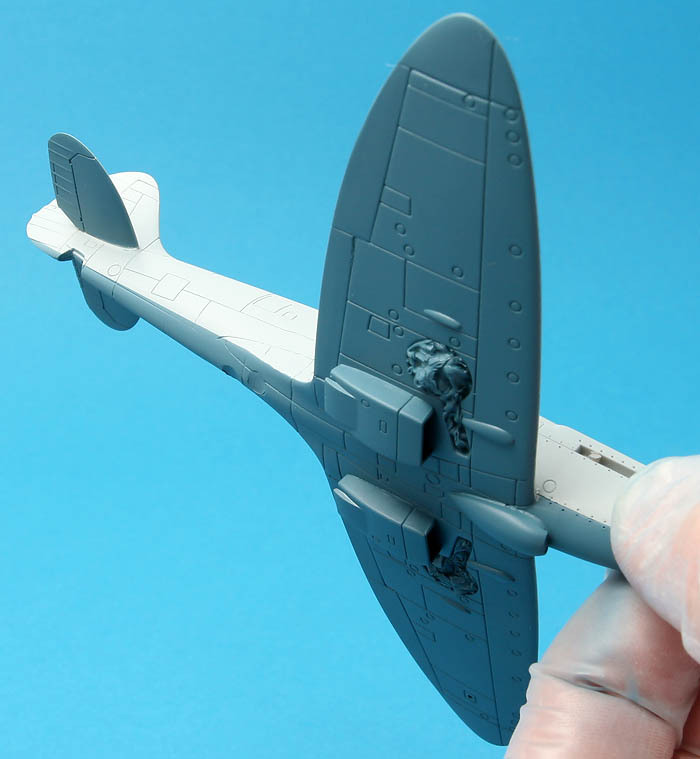 Decalling the Mk XIX was a breeze! Xtradecal are always a joy to use! There has been some debate regarding the underwing serials; some think they are white, some think they are black... Since other aircraft with blue lower wing surfaces have black serials I opted for black on mine as well, both options are included on the decal sheet. Only missing the prop! I'll keep the sprue section until I am finished with the weathering. One of the cannons look a bit saggy, I'll be bore sighting them before I glue them in place! 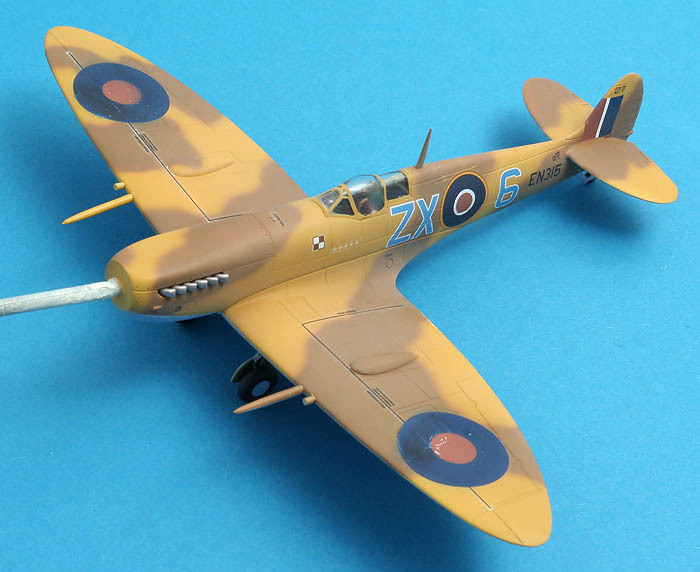 The split-pea experiment was done on the Spitfire prototype to assess how much round-headed rivets added to the drag over flush ones in the different areas of the airframe. Grat work on the models! Thanks for kind words and the pea update! I am working a bit haphazardly on the weathering. 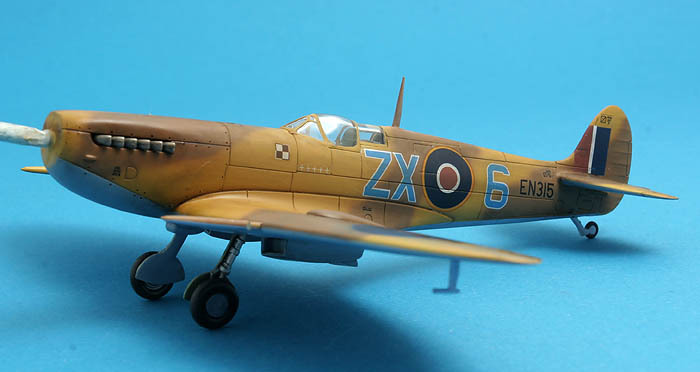 Up until now I have used ProModelers Weathering Wash and an oil colour wash. I'll probably use pastels and the airbrush as well before calling it a day! The glossy sheen on the wings is from Terpinex thinner that hasn't really dried yet!